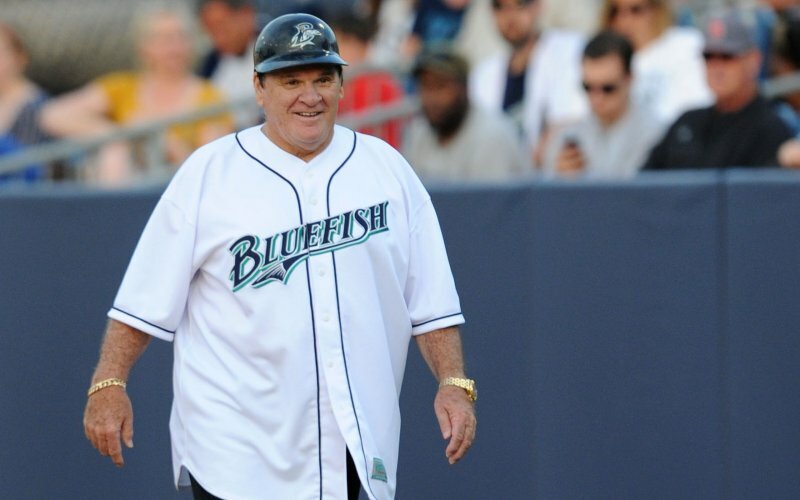 Pete Rose, baseball’s immortal Charlie Hustle, played manager-for-a-day in Bridgeport, Conn., Monday night, calling the shots for the Bridgeport Bluefish of the independent Atlantic League. It’s a far cry from the Big Red Machine. And it’s as close as Pete should ever get to returning to baseball. The “independent” in “independent Atlantic League” is important, because Petey has been banned for 25 years from all of Major League Baseball and all of its affiliate minor league teams. Among other things, this means that the man who had more base hits than any other player in the history of the game – the man who beat Ty Cobb’s unbeatable record of 4,191 and didn’t stop until he’d recorded 4,256, the man who was a thorn in every pitcher’s side and was the face of Cincinnati in the ’70s – is ineligible to to be elected to the Baseball Hall of Fame. Good. That’s how it should be. Rose, one of the greatest ever to lace up a pair of cleats, should never be allowed back in the game. Rose is 73 now, and he’s always had a groundswell of support from fans who say the hit king belongs in the Hall. On a side note, I’d be willing to bet that a majority of those same fans have no problem with excluding the home run king, Barry Bonds. Let’s just say the reasons are as clear as black and white. But this isn’t about Barry, who also doesn’t belong. This is about Pete. And the reason Petey isn’t in the Hall is that he took himself out of it. In 1989, after denying for months that he had never, ever, bet on a baseball game, Rose accepted a lifetime ban from the game — without admitting guilt — for, um . . . betting on baseball. Now, before the baseball writers can elect or reject him for a plaque in Cooperstown, the commissioner of baseball must lift the ineligibility Pete accepted. Let’s hope no commissioner is ever so forgiving. It took years for Rose, in a desperate attempt to get reinstated, to admit that yes, in fact, he did bet on baseball games. What’s more, he admitted, he bet on his Reds … while he was the team’s manager. Rose and his defenders argue that he never bet against the Reds. He only bet on his team to win. What’s wrong with that? There’s a lot wrong with that. Baseball, as we all know, is a marathon, not a sprint. There are 162 games, and even the really good teams lose 62 of them. Sometimes you have to be willing to lose because you have your eyes on the finish line. Unless, of course, your eyes are clouded by a bet. Did Petey ever keep a pitcher in the game longer than he should have, risking injury to the player, because he had money on the outcome? Did he ever put a player who desperately needed a day of rest into the lineup because winning a bet was more important? Even if the answer is no, he could have. A manager has to have his team – not his bet – foremost in his mind. And the bet opens the question of whether Petey did. Baseball, the great American pastime, almost died 95 years ago when the Chicago “Black Sox” took money from gamblers and threw the 1919 World Series. It literally took a player of Ruthian stature to bring the game back from that scandal. Shoeless Joe Jackson, one of the greatest players ever, was one of eight ballplayers banned for life afterward. You’ll find Shoeless Joe in a wonderful book that was made into a wonderful movie, but you won’t find his plaque in Cooperstown. OK, I believe him. And I also know that he does not deserve a third chance. He shouldn’t even have gotten a second one. There’s no betting in baseball. Period. Not even if you get 4,256 hits. This entry was posted in Baseball, In the News, Sports and tagged baseball, Big Red Machine, Pete Rose by stephenbromberg. Bookmark the permalink.